Mouthwatering aromas of ripe plum and freshly-baked rhubarb pie are accented with light notes of cranberry and black pepper. Critics describe it as a dark, dry and brooding Merlot. 3% Merlot, 135 Petite Sirah 2% Syrah, 2% Petit Verdot. The objective is to create a wine that has structure and complexity, but that is soft, smooth tannins..
from the Cabernet Franc grape and was first recorded in Italy in 1832. It is used for both the purposes of blending inspired by the Bordeaux wine region of France and also for the production of straight varietal wine. In the 1990’s particularly, Merlot experienced a huge surge in popularity and became the new trendy wine but its popularity has proved to possess staying power. In 2003 there were over 50,000 acres in California devoted to the Merlot grape alone. Some of the highest quality Merlots comes from Bordeaux, France, Napa Valley, Sonoma, Chile, and Washington State. These areas have elevated the historical planting of Merlot into better quality soils which have resulted in a Merlot that is less-suited for blending and perfect for its own varietal. The taste of a Merlot is dependent on the type of soil in which it was grown. For instance, Merlot from flatter and more clay-like soil results in a smoother, more velvety wine. Merlot grown in more mountainous regions tends to taste more similar to Cabernet Sauvignon. Many Merlots tend to have a taste reminiscent of Cabernet Sauvignon, but they has less acidity due to a thinner skin in the grapes and earlier ripening time. It also frequently possesses a wide variety of flavors such as: currant, plum, black cherry, caramel, clove, bay leaf, bell pepper, olive, and violet. 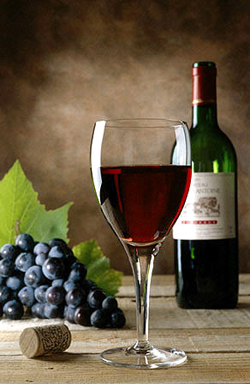 It is low in tannins and many wine drinkers believe that it is smooth and an easy-to-drink red varietal. When blended, Merlot is often combined with Cabernet Sauvignon to balance the taste strengths and flavors of each separate varietal resulting in a blend with the best of both worlds. Another benefit to Merlot and the Merlot/Cabernet Sauvignon blends is that the cost is often substantially less than the fuller-bodied Cabert Sauvignon varietal itself. Although many wine drinkers think that red wines should only be served right at room temperature, Merlot should actually be served a few degrees below room temperature as it can sometimes develop less pleasant tastes at approximately 74 degrees Fahrenheit. Chilling it for simply a couple minutes will ensure that the wine is slightly cooler and result in the best possible flavors. Delicate floral notes of rose petal and bergamot combine with hints of forest floor, earth and ripe cherry. Flavors emerge with raspberry, red current, dried cherry and minerals. The 2009 Pinot Noir is a beautiful example of classic Sta. Rita Hills Pinot Noir—delicate, subtle and endlessly layered. Notes of black cherry and worn leather explode on the nose. Thanks to the recent movie Sideways, Pinot Noir has become much more widely acclaimed by the general wine-drinking population in recent years and multiplied quite drastically in popularity. It originated in the Burgundy wine region of France but today, has spread around the world to vastly differing wine regions which encompass almost all wine growing areas. Despite its worldwide popularity, Pinot Noir remains among the most difficult varietal grapes to cultivate efficiently as it is delicate and difficult to control in terms of preventing mutations of the grapes or any other unwanted variations which result in undesirable changes in the flavors or other characteristics present in the grapes. Pinot Noir reaches its peak in flavor development when grown in cooler wine regions and has never reproduced the level of accuracy and perfection in development that it has achieved in its home in the Burgundy wine region. However, all Pinot Noir wines are typically a light hue of red which range from cherry to plum. They also possess a fragrant aroma encompassing notes of cherries, violets, berries, and spices. Like most other wines, Pinot Noir wines develop a greater complexity of flavors when aged. The aging process can contribute flavors reminiscent of leather and mushroom to the flavor dimensions of the wine. Pinot Noir wines are usually considered light or medium-bodied as they are quite a delicate varietal which often also encompass fine silky tannins. The Pinot Noir grapes, while notoriously difficult to grow efficiently, also become difficult to maintain consistency in the winemaking process. Winemakers struggle to modify the winemaking process for Pinot Noirs in order to find the optimal process to highlight the delicate flavor and structural aspects of this varietal. For example, winemakers must take great care in the aging of Pinot Noirs with oak barrels because the woody flavors can easily overtake the natural fragility of the flavors balanced within the Pinot Noir. Batches of Pinot Noir wine grapes can also be blended together in a way that masks the imperfections due to changes in the winemaking process or weakness inherent in the grapes themselves. When pairing Pinot Noir wines with foods, remember to go easy on the spices, otherwise the delicate flavors of the Pinot Noir will be masked. Salmon is one of the best pairings for Pinot Noir wines, as the flavors are both fairly light but with a complexity that compliments the opposite quite nicely. The 2010 cabernet has deep ruby aromas of ripe black currant, dark cherry, and lilac interlace with black pepper, bay leaves, coffee, and toasted oak to create a rich, dense nose. Cabernet is a term which encompasses a few different varietals: most notably Cabernet Sauvignon and Cabernet Franc. Cabernet Sauvignon is a particularly popular varietal which arose from a grape developed by crossing the Cabernet Franc grape with the Sauvignon Blanc grape. In fact, Cabernet Sauvignon is the most widely grown red grape in most wine regions of the world and particularly the Boudreaux wine region in France. In other parts of the world Cabernet Sauvignon is also referred to as Petit Cabernet, Sauvignon Rouge, and Vidure so it is important to keep those phrases in mind while abroad. Additionally, since the 1960’s, Cabernet Sauvignon has been the most common varietal term for red wines due to it’s wide appeal and critical acclaim. Because it is so widely in demand in many wine circles, Cabernet Sauvignon becomes easily subjected to inflation-related cost increases as demand from wealthy wine-lovers drives prices upward. On the other hand, Cabernet Sauvignon’s parent grape Cabernet Franc is less popular because it is a less desirable grape than its grape offspring. However, it is quite often used as a blending element in mixed varietal wines, particularly with Merlot. A general tip for most novice wine consumers is that most bottled wines labeled Cabernet belong to the Cabernet Sauvignon family of grapes, rather than the more herbal flavor that arises from the grape’s exposure to increased moisture and excessive soil-based nutrients during the growing process. The grapes themselves are comparatively small with a tough outer skin that protects the grapes from many elements. They are considerably resistant to disease and can be viewed as a fairly hardy grape varietal.Cabernet Sauvignon is also one of the best aged wines. It is traditionally aged in small oak barrels for up to eighteen months before bottling. This aging period allows the wine to develop a greater complexity and depth of the flavors it encompasses. Some of the flavors which are most often attributed to Cabernet Sauvignon are: dark cherry, black currant, olive, pepper, cedar, and tobacco. Cabernet Sauvignon’s can also sometimes have spicy or earthy taste profiles as well. The D-Cubed Cellars' Petite Sirah has raspberry and blue berry fruit and sage aromas. This medium bodied wine has chewy tannins with nice fruit and herb flavors. Opaque dark purple color with aromas of violets and blueberry. Sweet and jammy blueberry flavors dominate the palate with silky tannins smoothing out the lengthy, warm finish. Shiraz currently accounts for one-fifth of all wine grape production in Australia and is one of the most widely harvested grapes in the country. Though the intense popularity of the rival red Cabernet Sauvignon has accounted for the secondary status of Shiraz in the minds of wine consumers in recent years, many vintners are beginning to revitalizing their Shiraz with new styles and methods of aging. The Shiraz wine grape has an interesting history and place in the contemporary wine world as well. Generally described as “New World” wines, these wines are generally thought to be more fruity in their predominate flavors in opposition to the “Old World” wines which are often labeled Syrah. Because both variations of wine are derived from the same grape genetically, the differences between them are minimal to say the least. Some wine purveyors even maintain that the distinction between Shiraz and Syrah is in relation to style preferences only. However, South Africa, Canada, and Australia are three of primary growing regions which refer to this varietal of wine as Shiraz rather than Syrah. These regions keep with the trend of identifying their exports with the New World wine classification of Shiraz which identifies it as a lighter and more aggressively fruity style of wine. The Shiraz grape is commonly used in the production of red table wines which characteristically age well. Shiraz often reaches its prime complexity of flavor after approximately ten to fifteen years of aging; however it can easily be consumed much earlier in its aging process without sacrificing its excellent taste. It is also commonly used as a blending wine, although this occurs primarily in Spanish regions. Shiraz wines are characteristically quite full-bodied and flavors vary easily depending on the physical characteristics of the wine region of its production. Some of the flavors most commonly attributed to Shiraz wines are: blackberry, chocolate, black pepper, plums, and spices. Shiraz also has soft tannins and varying degrees of oak flavors. They flourish especially in the wine regions of Australia with cooler, dry climates which allow for the berry finishes. Other Shiraz wine grapes grown in warmer climates tend to encompass the more mellow plum flavors. Despite its frequent New World wine associations, Shiraz is one of the oldest known wine grape varietals. In fact, it is named for the city of the same name in Iran where wine-making may have originated many thousands of years ago. The flavors from the Santa Cruz vineyards exude aromas of cherry and fig combine with spicy notes of vanillin and pepper. The 2011 Geyserville is a ruby color. Scented with bramble fruit, mint, gravelly earth, sweet oak, as well as black tea, and sweet cherry fruit. Zinfandel often gets a less-than-stellar reputation among the most pretentious of wine drinkers as it has recently held the reputation of being a “starter wine,” especially for women, due to its popular sweet taste in the 1980’s and 90’s. However, in the past several years, winemakers have responded to this prejudice against Zinfandels by improving the complexity and balance of flavors within their wines to make them a more palatable choice to the savvy wine consumer’s sophisticated sense of flavors. What makes a wine more appealing to wine lovers? Complexity and fullness of the flavors are a few of the key aspects of a well-crafted wine. In Zinfanfels, a few of the most popularly described characteristics of the flavors are blackberry, raspberry, cherry, cloves, black pepper, and anise. However, depending on the complexity of the Zinfandel, many other levels of flavors may emerge, especially through a tasting in which you carefully give your attention to the subtleties released within the entire experience of the wine. Another interesting characteristic of Zinfandels is that they are also often mixed with others such as Cabernet Sauvignon or Petite Syrah. Because Zinfandels range from lighter-bodied whites to quite robust reds, they are no steadfast rules for which foods to pair with them. Some zinfandels do possess enough body and presence of flavors to drink even with a hearty steak or rich chocolate dessert. The lighter zinfandels can be a great pairing for Latin American and tropically-inspired foods. Zinfandel originates from a distinctly American red-skinned Zinfandel wine grape that is used to make both red and white Zinfandels. Formally named in 1832, Zinfandels are traditionally defined as an American varietal and can occasionally be quite difficult to locate in overseas markets. It was recently discovered that Zinfandel grape is genetically identical to the Primotivo grape native to Italy. This discovery begins explains the previously unknown heritage of the Zinfandel grape’s development. Californian vineries have come to embraced Zinfandels as their own characteristic varietal, leading the reputation of Zinfandel to become a representation and branding image for California wine. Some of the most popular regions for the production of Zinfandels are: Napa Valley, Sonoma, Mendocino-Lake, Central Valley, Bay area, Sierra Foothills, and Southern California. However, Zinfandel’s aren’t exclusive to California and can be produced in American regions as distant as North Carolina and Tennessee, as well as overseas locations to which the Zinfandel grape has been exported. Chardonnay has become the most popular white wine in America in the past few decades. The reasons for this development are varied. The first is that Chardonnays possess a widely appealing taste often consisting of fruity and full-bodied buttery notes. Due to the wine’s versatility, it can possess many distinguishable variations of flavors and vintners can even mix Chardonnay with other varietals as a way to experience new flavors with blended wines. One of the other most important reasons for its popularity is that it’s widely available and can be quite inexpensive due to the small, hardy Chardonnay grapes resistance to many diseases and thus easier to grow in many conditions. Thus, the demand for Chardonnay becomes easily to fill, despite the fact that Chardonnay grapes are more delicate in the wine-making phase of development. Some of the key distinguishing characteristics of this well-loved wine white are that it is dry and often quite full-bodied with the most popularly distinguished flavors and aromas mentioned in descriptions of Chardonnay are apple, melon, pears, lemon, and pineapple, as well as buttery, nutty, creamy, vanilla, oak, and citrus. Particularly when Chardonnay is aged in an oak barrel, it develops a toasty or buttery quality along with a vanilla or coconut flavor which adds to the depth of the richness in the tasting experience. Many cheaper types of Chardonnay that try to achieve the oak-aged taste, use steel barrels with oak chips to lessen production costs while still obtaining similar flavors and textures within their wines. Chardonnays are one of the most popular varietals grown in the California wine region but also flourish in Australia, New Zealand, Argentina, Chile and South Africa. In 2000, Chardonnay grapes accounted for 40 percent of the total white wine grapes planted in California wine regions and can thrive in many regions with quite distinguishably different weather patterns. French Chardonnays are also reputed to be of extremely high-quality and in fact, in the Chablis wine region of France, Chardonnay grapes are the only grape varietals allowed. Today’s Chardonnays are less-heavily subjected to oak fermentation as public preference has shifted to lighter and crisper versions of this varietal. The reason for this preference can be viewed as a return from the past several decades in which all chardonnays were so heavily processed with malo-lactic fermentation and other aging techniques that even the most distinctive Chardonnays began to lose their distinctive flavors. This Fume Blanc has aromas of orange blossom, quince, white peach, Meyer lemon and mango complemented by flavors of pineapple, pear and guava. The fresh style of Sauvignon Blanc for which Geyser Peak is famous. The fruit flavors are abundant and the acidity bright and crisp. Sauvignon Blanc is a currently very popular white wine varietal. Californian Sauvignon Blanc is also occasionally referred to as Fume Blanc. The growth of Sauvignon Blanc grapes encompasses nearly 14,000 acres in California alone. Sauvignon Blanc is also grown in regions such as South Africa, New Zealand, Chile, Italy, France, Australia and can even be grown in surprising regions such as Canada and Long Island, New York. Sauvignon Blanc is often viewed as the best white wine for many food combinations as its tangy, aggressive flavor pairs well with foods. It is especially well-matched with foods containing components such as peppers, garlic, cilantro smoked cheeses, and tomatoes which are foods that would ordinarily completely overpower even the strongest-flavored Chardonnays in addition to most other dry white wines. Sauvignon Blanc possesses a unique aroma which makes it easily identifiable compared to other white wines. Its flavors tend to be classified as herbaceous such as those of lemongrass, gooseberry, and freshly mown grass. However, it also possesses some other more traditional flavors such as green melon, grapefruit, passion fruit, and bell pepper. Overall, Sauvignon Blanc is a strong, tangy, and flavorful varietal that outweighs many other white wines in intensity and sharpness of flavors. Unlike many other wine varietals, Sauvignon Blanc is not frequently aged in oak barrels because it often departs an unfavorable taste combination. However, Sauvignon Blancs are frequently blended which is a technique that calms their occasionally abrasive tastes. Blending Sauvignon Blanc with Semillon (another wine varietal grown primarily in France) is a popular practice, especially in France’s legendary Boudreaux wine region, as the Semillon adds a fig flavor and softens the overall taste profile of the Sauvignon Blanc. The ratio of Semillon blended with the Sauvignon Blanc ranges on the region and occurs primarily in France. However, some versions are comprised of 70 percent Semillon and 30 percent Sauvignon Blanc and other varieties are comprised of the nearly inverse ratio of 75 percent Sauvignon Blanc and 15 percent Semillon. These blends are a perfect option for the wine consumers who enjoy some of the flavors of Sauvignon Blanc but find it a little too aggressive for their palates. Because Sauvignon Blanc is still not as popular with many wine drinking consumers as its more popular cousin varietal Chardonnay, many quality Sauvignon Blanc are very economically priced. Combined with its perfection in matching many difficult to pair food combinations, Sauvignon Blanc is a great choice for a dinner party varietal.